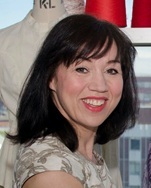 Janet Coulter holds a BA (Hons) In Textiles and Fashion Design. She has an MBA; an MSc. in Multimedia with Computer Based Learning, and a Post Graduate Diploma in Higher Education. She is currently undertaking a PhD in the field of wearable technology and is investigating the relationship between clothing and technology, as a key driver to connect wearers to their bespoke ‘Internet of Things’ for personal health and well-being. Coulter is a Senior Lecturer in Fashion Design at Ulster University, and a Senior Fellow of the Higher Education Academy, UK. She is also a Fellow of The Higher Education and Research Practice, at Ulster. Additionally, she holds the position of Director of Academic Enterprise and Innovation, within the Faculty of Art, Design and The Built Environment and has responsibility for engaging industry and community to work with academics and students in entrepreneurship projects in the Creative Industries. In 2013 she was awarded a Distinguished Fellow of Enterprise, by Ulster for her contribution to the economy, both locally and globally. Before entering academia, Coulter was a practicing fashion designer in industry. She worked in the field of international design intelligence in Paris; She also worked in couture fashion design in London, and was a design manager of a fashion manufacturer in Northern Ireland, managing portfolios of commercial and corporate wear design; Coulter has 18 years of teaching experience in higher education and her expertise is in creative design, industrial design, advanced 3D pattern engineering and CAD based design technologies. She also teaches design management and entrepreneurship in the creative industries to students and SMEs. She is currently an external examiner at Robert Gordon University, Aberdeen. Coulter has been PI on a number of research grants and has completed extensive projects in protection for sports and military, including: Moisture management in soft body armour; 3D thermoplastically moulded armour for female officers; Quick release systems for battlefield situations; Streamlining production and efficiency in sizing for military armour. Additionally she has had successful research projects in developing drag co-efficiency garments to reduce risk of injury in greyhounds; and sustainable design projects, developing sportswear jackets with bi-products from duck farms. Recently she has been developing research interests in the co-design of wearable technologies and collaborated with Robert Gordon University, Edinburgh University and Dundee University on an AHRC funded project called - Co-Design for Second Skin, which investigated applications of advanced technology and design, to develop new wearable smart clothing concepts to support mobility and health issues. Recent consultancy projects include: Security and charging technology embedded in travel bags; Sports training products to promote safe lifting in rugby lineouts; Re-purposing commercial textile waste; Thoracic support vests for post surgery.